Bajau children learn to swim around the time they take their first steps. The hours they spend underwater serve to strengthen their eye muscles, enabling them to see as well as some marine species do. They don’t use scuba equipment, instead learning to hold their breath for up to five minutes, and to know the relaxed, almost trance-like state that precedes a long dive. 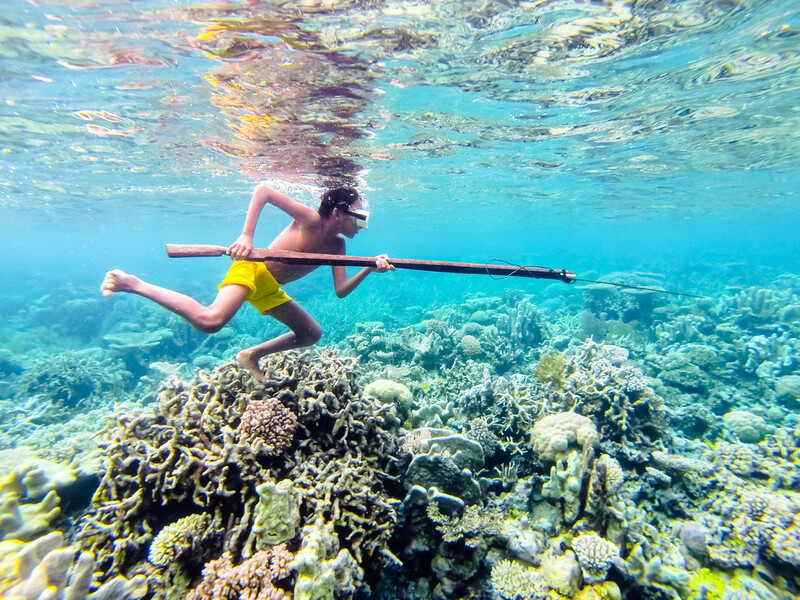 Studies have shown the Bajau to have less oxygen in their blood, which further facilitates food-finding trips into the deep. Humans of all tribes leak salt water from their eyes when sad and from everywhere else when hot. We enter this world after nine months of immersion in saline fluids. We are, in short, more like sea creatures than most of us admit; a much-disputed theory even posits that marine mammals, not primates, are the true ancestors of hairless homo sapiens. 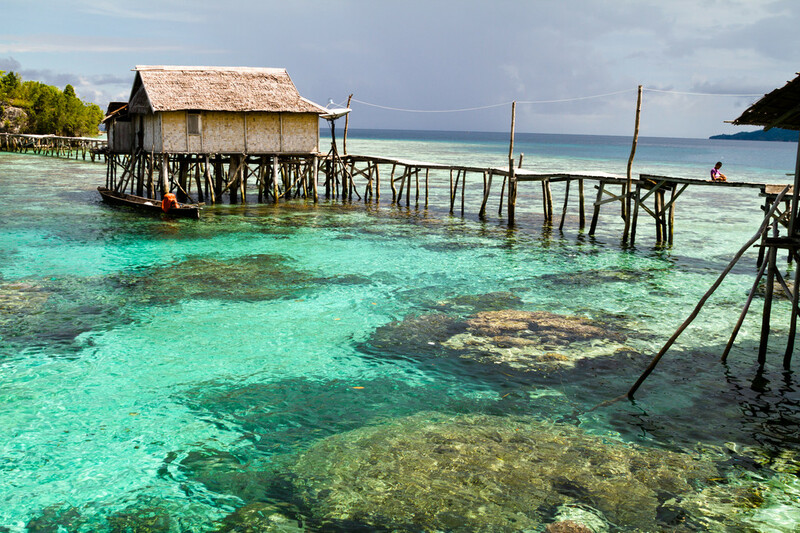 Whatever the case, the Bajau people of Southeast Asia are a striking example of humans as a sea-friendly species. Heirs of an aquatic culture that is at least 400 years old, they lead lives as fully integrated with the ocean as any group on earth. It almost goes without saying that their traditional way of life is threatened. Many Bajau have now traded in their prized lepa-lepa—handmade wooden longboats—for city living, or migrated (often under political and economic pressure) from stilt villages hundreds of meters offshore to more-recent constructions on terra firma. 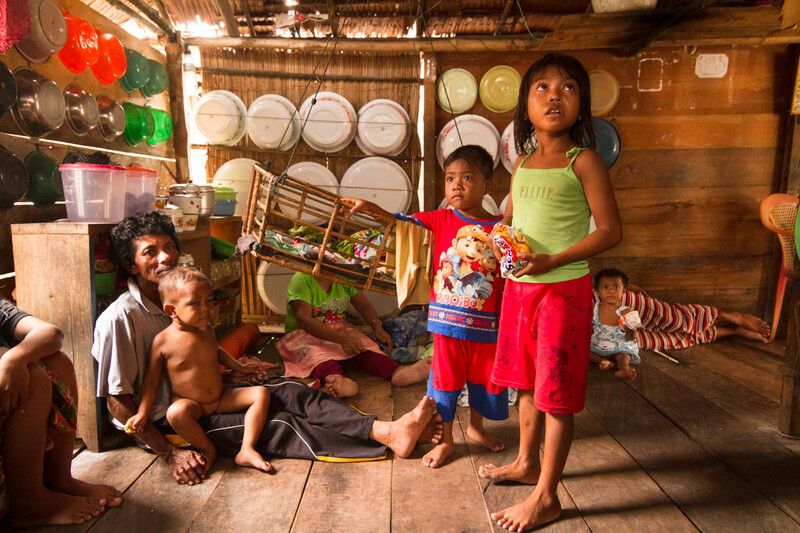 Across rapidly industrializing Southeast Asia, as in many places, it’s harder than ever for simple hook-and-line fishermen to make ends meet. 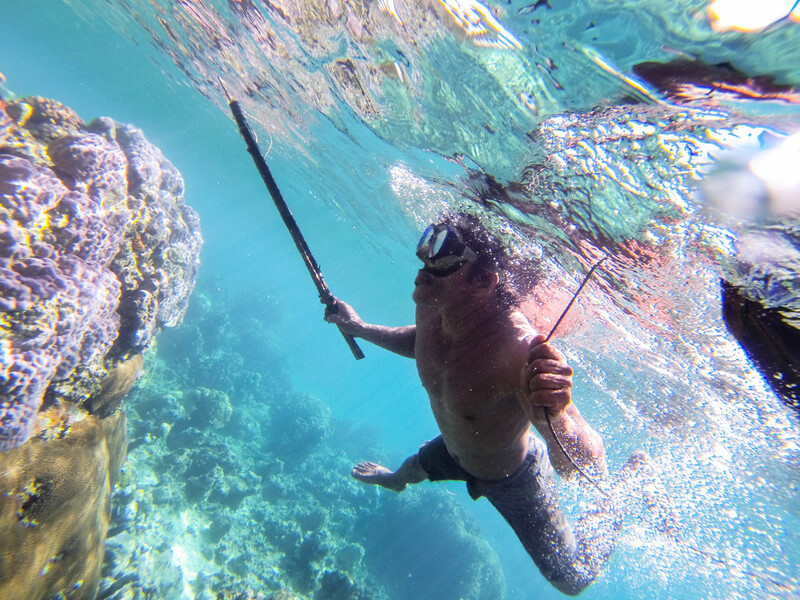 Still, a proud Bajau minority hews mostly to the old ways, spending most of their life on the ocean or underneath it, scraping a sustainable livelihood from the reefs. The watery world here is a rich one. 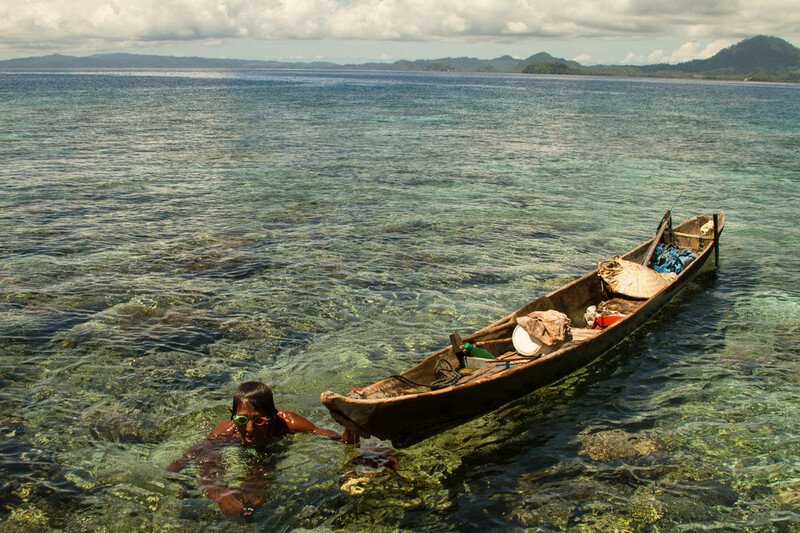 The Bajau of Sulawesi inhabit a spread of sea between Malaysia, Philippines and Indonesia known as the “coral triangle,” a hub of biodiversity that lays claim to one-third of the planet’s coral reefs. The reefs are not as overflowing with marine life as they once were, but still offer treasures: one is the sea cucumber known as trepang, a delicacy in Asia, which the Bajau harvest at night. Mother-of-pearl and octopus also bring good prices. 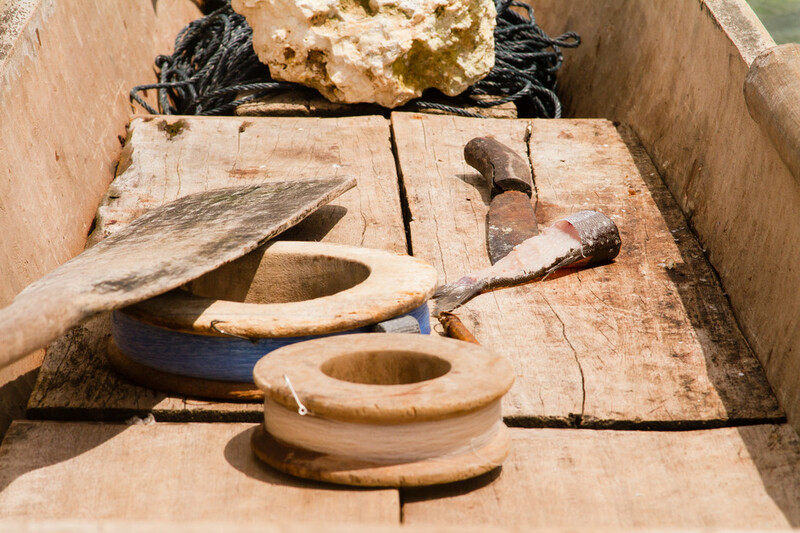 The crustaceans and mollusks that fetch less in the marketplace they save for themselves, preparing them over small fires on their boats or in their huts. Bajau spiritual practice is a combination of Sunni Islam and animism. Those still in tune with the old ways make offerings to their god of the sea, and acknowledge the spirits that dwell in tides and currents. Of course, they also rely on their own formidable ability to become a fish-like predator. Another benefit in this department: their lean physique, which allows the body to distribute oxygen more efficiently and minimizes their buoyancy as they stalk the seafloor. Their tools are simple ones: homemade spears and wooden goggles. But not always. 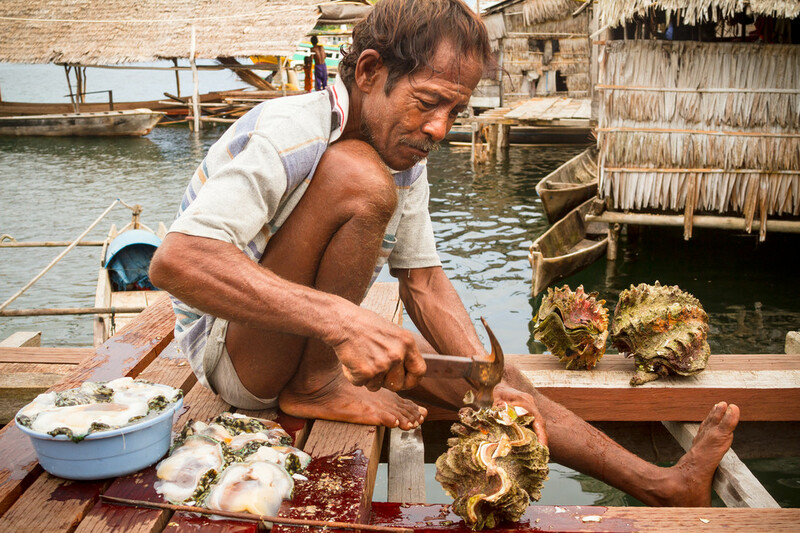 Some Bajau have resorted to destructive modern methods to stay competitive in Asia’s live-fish trade, dropping potassium cyanide and fertilizer bombs into the water to stun their prey but not kill it. Even their usual range of up to 20 meters (65 feet) can be dangerous. The traditional methods are not without risk. A young Bajau destined for a life of underwater harvesting typically has his eardrums ruptured at a young age, to reduce pain while diving. It helps him get what he needs, but after years of water leaking in through the punctures, he is more likely to be hard of hearing as a grownup. 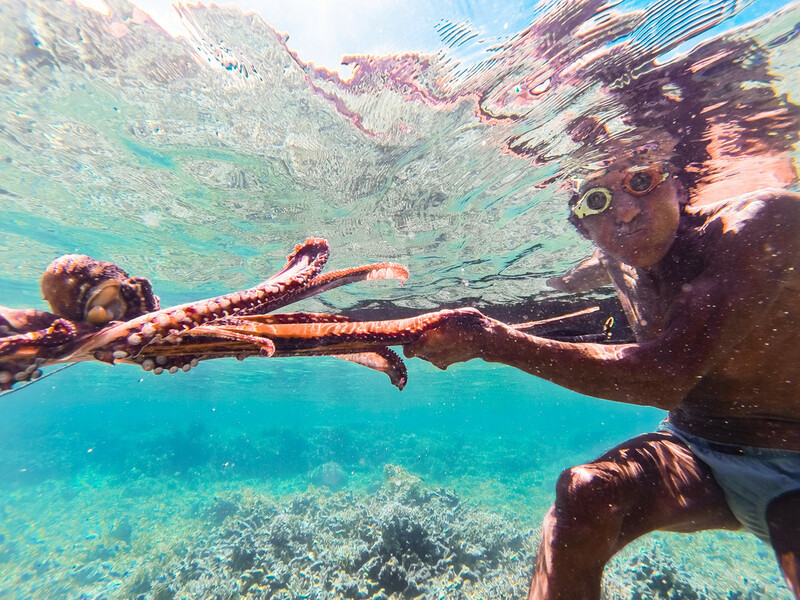 For much of their lives, though, Bajau free divers are seeing and hearing the underwater world—unburdened with advanced technology, and on an almost daily basis—in a way that few humans do. For centuries they came to shore only to trade, make boats, and bury their dead. 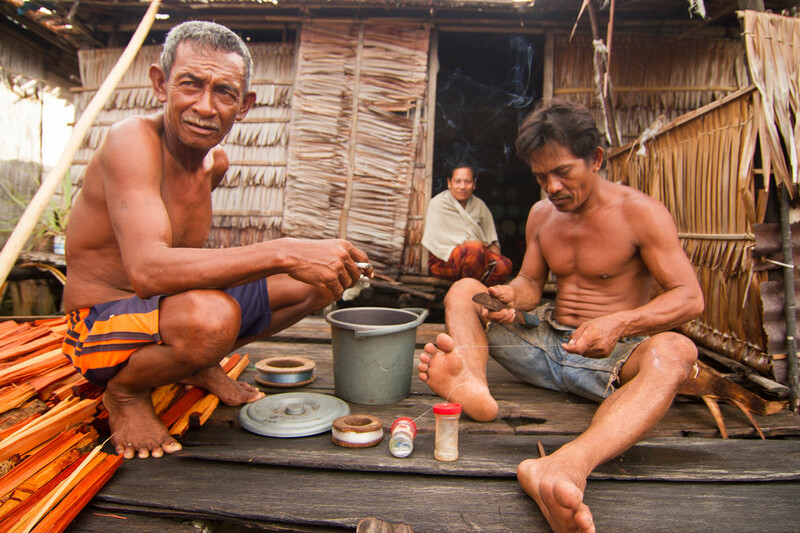 There is another Bajau ailment, albeit one that the older generation tends to speak of more: ‘landsickness.’ It flares up when a person is away from the sea for too long.